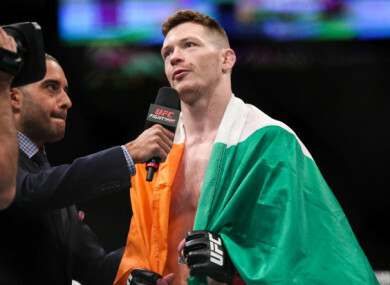 JOSEPH DUFFY WILL make his long-awaited return to the Octagon in six weeks’ time, with the Donegal native’s bout against Marc Diakiese confirmed for UFC London on 16 March. The 30-year-old has not fought in 16 months after a rib injury suffered back in November 2017 ruled him out of UFC Adelaide, where he was set to face veteran Ross Pearson, as well as his scheduled return at UFC Fight Night 142 in December. On Friday his much-anticipated return was confirmed, with Duffy set to take on Diakiese in what will be the Irishman’s seventh UFC encounter — his record in the UFC currently stands at 4-2. The English lightweight is currently on a three-fight losing streak, having previously gone 12 unbeaten. The pair will face off at the O2 Arena next month, with Darren Till versus Masvidal the main card and Gunnar Nelson also set to face Leon Edwards. Diakiese will be Duffy’s first fight since losing to James Vick via TKO in Madison Square Garden at UFC 217. Email “Joseph Duffy to make UFC return on St Patrick's weekend after 16 months out”. Feedback on “Joseph Duffy to make UFC return on St Patrick's weekend after 16 months out”.